Molecular computer graphic showing protein chains in an antibody-antigen complex. The antigen (blue) is at top, with the antibody (red & yellow) below. The antibody consists of two chains of proteins, shown as ribbons. The yellow ribbon is the heavy protein chain, which determines the class of antibody. 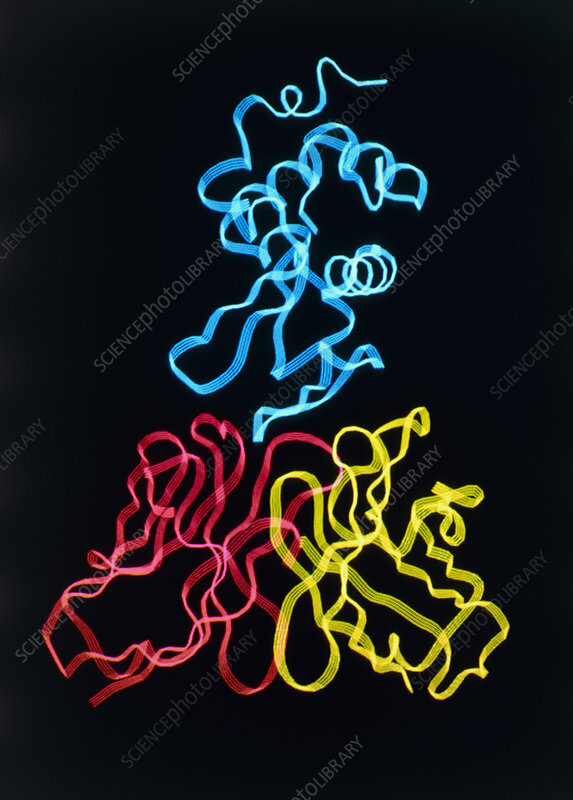 The red ribbon is the light protein chain, which determines the specific structure that enables the antibody to recognise & bind to a particular antigen, in this case hen egg white lysozyme. The lysozyme was injected into a mouse, which then produced the appropriate antibody. Photographed by MM 23/7/88.